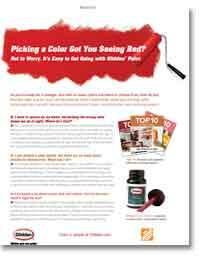 Picking A Paint Color Got You Seeing Red? So you’re ready for a change—but with so many colors out there to choose from, how do you find the right one for you? Let Sensational Color’s Kate Smith show you how easy picking a paint color can be, with three easy tips that will help you find your perfect color—and kick start your painting project. Q: I want to spruce up my home, but picking the wrong color keeps me up at night. Where do I start? A: First, you want to choose an atmosphere you’d like to come home to day after day. Maybe you’re craving a place where you can kick up your heels, or maybe it’s a lively, fun space for entertaining. Glidden™ Paint can help you get inspired with their Top 10 color palettes selected by design experts. Check out Top 10 Quiet Time Colors, or for something more dynamic, see what a pop of color can do with Top 10 Accent Colors. Still not sure? See the full array of Top 10 palettes at Glidden.com. Q. I have no trouble picking a paint color family but there are so many great shades to choose from. What can I do? Try a simple designer trick and ask yourself, “What’s in my closet?” If your hangers are filled with lavenders and soft yellows, then you’re most comfortable and happy with feminine, ladylike hues. If those drawers are packed with ochre and indigo, you might feel more comfy in a room that has a rugged spirit. It’s an easy way to see which colors you’re naturally drawn to. We decorate our homes like we decorate ourselves— so what could be more exciting than realizing you already know exactly what you like? Q: I’ve heard a lot about warm and cool colors, but I’m not sure what’s right for me? A: When you’re looking at your Glidden™ color palette, warm neutrals like Elegant Ivory or Shell White make you feel calm and cozy. Dove White or Quiet Rain are cool and feel refreshing, like a mint. 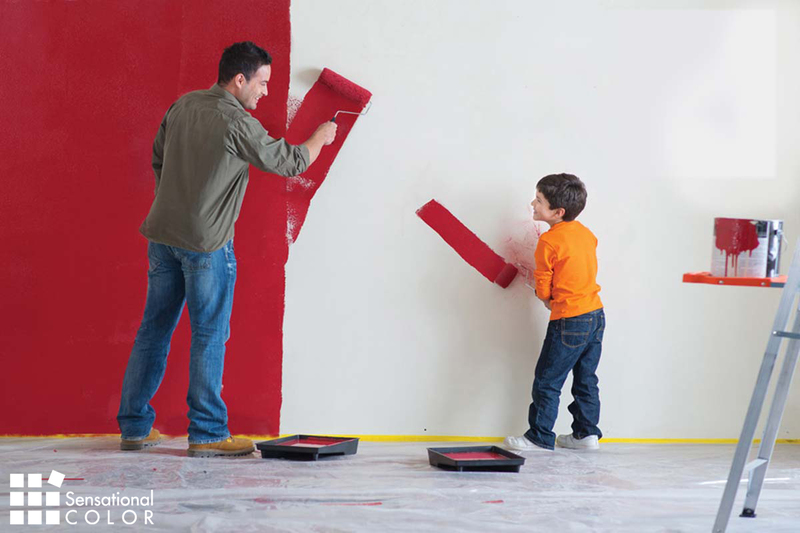 If you’re still not sure, visit a Glidden Color Center at The Home Depot and bring home some ready-to-go testers. They come with built-in brushes— available in every color. Put them up on the wall and see what feels right to you. This article written by Kate Smith originally appeared in a Glidden™ Paint advertorial in the September 2010 issue of House Beautiful magazine. I wanted something fresh for one wall in my dining room, something warm. It took repainting it five times to get one I could live with! Each day I’d paint and then look at it in the morning light the next day and each day until the fifth, it was horrible. The changing light during a day can really make a difference! Color is light and as you experienced it can really change the way a color appears. I’m glad you were able to find the right color for your room.